If any of you Commonwealth pilots would like such a certificate of your own to add to your OFF flyer's virtual portfolio you can simply send me the pertinent info on your pilot, (i.e. name, date and place of birth, date certificate was awarded, and certificate number), along with a photo, and I will be happy to plug those items into the template I now have, create the new certificate, and email it to you. And, if you pop back over to the following thread, An Incredible OFF Pilot Persona History Resource , you can find a pilot persona to use along with the needed info I just outlined. As for the photo, many RFC pilots pics can be found simply by doing a Google search. Just think how much more of a vested interest you'll have in your brave OFF aviator with this bit of added immersion. Looks great, Lou! I love such additions to our immersion! With this idea, you got me hooked for another British Campaign carreer now. I don't have the time right now, but will later send you all required to make me one. I'll have to do a decent pilot photo. I might even add a German license, if you don't mind? Or did you intend to make one? Thanks Olham, glad you like it, and send me the info anytime. 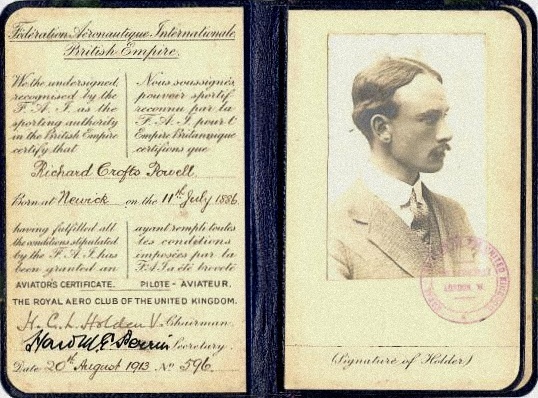 Also, I would very much like to put one of these together for our Central Powers flyers but I haven't located a good image of a WWI-era German pilot certificate to use as a guide. If anyone has a picture of such a document that I can use it would be very helpful. Yes, very nice indeed, Lou. Interestingly I used exactly the same original as my source but not as crisp an image as you seem to have found. I am hence particularly envious of your leatherette binding because when I blew my source up it had too many horrid jpej artifacts and I had to create the binding from scratch too. I recommend 1001fonts.com if you want to improve your font collection - but I'm sure you'll already be familiar with it. Here is one, Lou - I sent it per PM, but I think you can also download it from here. Holy schnikee Olham, that's a beauty! Many thanks Sir, and I will use it to build a German version of the certificate and you will be the first to have one issued. Just send me your pilot info. Dej, that is exactly where I located the script fonts I used for this, (along with many others over the years). I want to thank you again for jogging me old memory on this project, because if it weren't for your posting it would have sat for God knows how long. If you like, it would be my pleasure to rebuild your personal certificate using the template I built. Just let me know. Amazing what you guys are able to find from the net and then use it to your advantage in creating OFF pilots. Well, men have flown to the moon for somehandsfull of stones and dust - it's all only a game. Well, at least playing OFF is a lot cheaper to the taxpayers than going to Moon to play with stones. Reading about the early days of aviation, it's amazing how easy it was to get one of those certificates compared to what is required of modern pilots. But air traffic wasn't much of a problem back then, you could fly peacefully pretty much everywhere without having to fear about crashing into some other aircraft, though the risk of crashing somewhere else was considerably higher than with modern aircraft. A kind offer, Lou, and no less than I've come to anticipate of a gent like yourself. But you've inspired me instead to redo mine - I'm a glutton for punishment - the kerning on that copperplate text is a biatch! . May I ask though if the original you posted above is full size? If not, I'd appreciate the link. Ah Dej, you're a man after my own heart. If there's a tougher way to do things, I try my best to find it as well. That original I posted is the size I found it in, so what you see is what you get. I increased it by doubling the pixel count which gave me the detail you see in my finished document. Olham, your template is ready. I hope it will serve you well Sir, however I make no claims as to the accuracy of the text on the seal since all I was able to do was trace over the existing one before cutting, pasting, masking, dusting, scrubbing, and generally using every trick I had at my disposal to clean up the certificate. I did leave a bit of the grime on it as I think it makes it look more authentic that way, and in particular I kept the edges and lower corners dirty since that is where you would plant your thumb when opening it up. Lou, you seem to be even more fit on Photoshop than I should be as a graphic designer! of Berlin city. I'll have to re-do it anyway after putting my photo in. Thanks a lot - you have done most of the work! I don't know about being more fit than you in the graphics editing department Sir. More AR perhaps, but doubtful more fit. Appreciate the info on what that stamp is supposed to read, I couldn't make it out myself. Have fun finishing it up. Ras, not sure about an all-in-one list of the German pilots in WWI, but Olham may well be able to steer you towards something. Das Bundesarchiv possibly? The stamp is fairly easy. Create a new layer, pull a pair of circles in the correct purplish color, and then add text in the same color. After that you simply throw in a bit of noise and set the opacity at around 60% or so and "Violà! ", you have a stamp. The French aviateur certificate is quite easy as it is nothing more than a single-language version of the one I built. The American ones are a bit different, but I have a Great War example of one somewhere, if I can remember where that is. if any of your relatives/ancestors were pilots with any of the Jastas then they should be found in 'The Jasta Pilots' - Norman Franks, Frank Bailey and Rick Duiven. That book is, as its dust jacket claims "as comlete a list of all Jasta pilots who served in those front-line units... as can be found" [my italics]. It also covers known pilots who served in the Marinefeldjagdstaffeln and the Kampfeinsitzerstaffeln. A lot of records were lost in WW2 and I'd hazard that without a comprehensive record of what there was, it's difficult to gauge the completeness of what remains. Ras, the only source I know is the book "The Jasta Pilots" by Norman Franks, Frank Bailey and Rick Duiven, as Dej already said. I just recently got this book. It contains a long list of names of the Jasta pilots, and the Marine Jasta pilots. I would see through the alphabetical names lists for you, if you could send me a PM with your ancestors' names. What I can say already, is that there is no "Rasmussen" in any written form of that name in both lists. Okay, here is my first attempt. Nice work, Olham. You don't have a picture of yourself wearing a monocle and looking like some arrogant Junker from Ostpreussen? Now that would be perfect! That signature looks like Sütterlin-Schrift to me (I'm no expert though). But wasn't it introduced only during the war, so that a pilot who was born in 1895 would have learnt at school something different, most likely deutsche Kurrentschrift, which is very similar to Sütterlin, but is older? Just an idea to make it even more authentic-looking. Like I mentioned earlier, it's really amazing what you guys are able to do! 16 then, and still on the Gymnasium. He was among the first to learn and use it. Oh, and yes - I have made a "German wild hog" officer picture with monokel. If I find it, I'll post it. It was meant to be my alter ego - the Bordeauxred Baron. I hope you'll find it - I'm sure it looks great, just like something out of a bad Allied propaganda movie! "Vee have vays of dealing viss sose who vill not fly in zee OFF skies for zee Kaiser, and you vill not vish to know sose vays, I can assure you. Now zen, sign zee papers." But seriously Olham, your "Flugzeuführerschein" is look very good. Well done. You must have just missed it, Hasse Wind - I added it above. 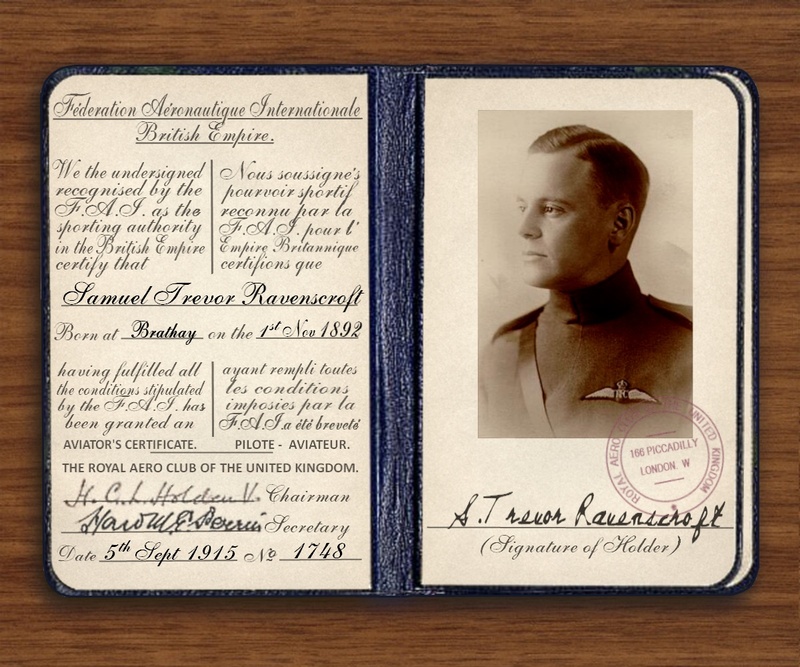 An attempt at an American certificate and fictional pilot using RAF's post following and hour or so of photoshop layering. Attempted to create an embossed seal instead of a stamp, but think I am going to have to work on it some.